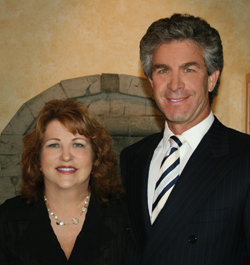 Pictured are Rosemary Murphy and Dr. Mark Berman at the Med Spa Symposium held at Beyond Harmony MedSpa on September 18. Guests enjoyed an intimate presentation and question and answer session with Dr. Berman, who is a pioneer in advancing the technology of volume replenishment to naturally restore contour to the aging face. Refreshments were provided by RSVP - The Catering Company. MB2 Raceway, the consumer racing corporation operating in the San Fernando Valley, opened a new consumer racing complex in Thousand Oaks, located at 1475 Lawrence Drive. Mellady Direct Marketing has implemented a new money-saving option for customers mailing DVDs and CDs. New packaging approved by the U.S. Postal Service for automatic sorting saves clients the non-machinable surcharge of 20 cents per piece. The new jacket enables mass mailings of CDs and DVDs to be presorted and bar coded, with each disc securely sealed in its own individual package, and ready to be processed through the postal service's automatic sorting machines. Before, such mailing had to be hand-processed at postal facilities and incurred the surcharge.